This film won the Best Foreign Language Oscar in 2008. 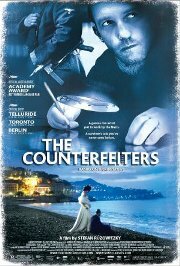 Set during World War II, it is the tale of the world's best forger, a Jew of Russian extraction. He is arrested by the Nazis and interned, but as the war started going against Germany, they came up with a plan... They decided to weaken the US and British economies by flooding the market with fake currency. The Russian Jew was just the man to make the money. Offered a take-it-or-die deal, he set to work with a hand-picked team, producing perfect forgeries. However not everyone on his team was happy with the moral problem: by helping the Nazis, they were delaying their own freedom. In German language with English subtitles.